It has been too long since I've posted so I think I had better make several posts so they don't get too big. This one is all about the bees. 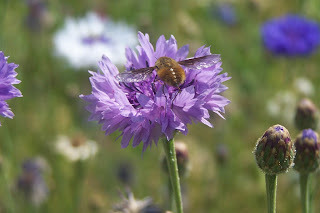 Not just honey bees but other pollinators as well. 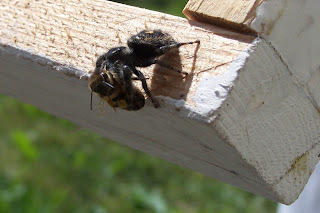 This photo of a bee being eaten by a spider is just because. This is the second time I've seen this recently. I wonder if bees taste like honey? I left a patch of wild motherwort growing in my garden because we use it in our herbal tea, Femininitea which is for PMS and menstrual cramps. Motherwort is a natural sedative which is safe for women to use when pregnant or nursing. It has a bitter taste so we blend it with bee balm as well as cramp bark, bayberry bark, and raspberry leaves in our Femininitea which gives it a flavour similar to earl gray tea. 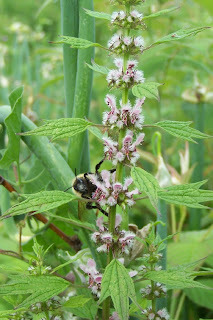 This is a bumble bee on the motherwort flower. Here is a honey bee collecting pollen from a gorgeous pink climbing rose. I posted a similar picture last year too but I can't resist. Here is a very strange looking long legged bee or some kind of insect on a purple bachelor's button. I haven't figured out what it is yet but it is new to me. Anyone know what it's called? We have discovered these amazing organic beekeeping podcasts. I especially enjoy the fat bee man.